The following tribute was given by Trevor's twin brother, Brian, at Trevor's funeral on 15 July 2011. Trevor was born in Hull on the 20th July 1936; I arrived twenty minutes later. In 1941, due to heavy bombing of the city of Hull, we both had to be evacuated. We were then five years of age. This was the first time we had been alone together. 'Together' is the word that encompasses the life of twins. We slept in the same bed until we were 25 years old. We shared the joys and pain that life has bestowed. We got married on the same day; not even national service could separate us. We learned to play musical instruments together; we practised in our bedroom together for one hour every day. We performed on stage, radio and television; we made recordings, always together. In the recent past (2005) a friend of mine met Trevor and me for the first time. Afterwards he said, "Trevor was the first born wasn't he". When I asked him how he knew he said it clearly showed in the body language between us. This remark prompted me to look at a series of photographs taken over a 25-year period to see if there was any visual evidence. I wasn't sure what to look for but to my surprise I found that Trevor always stood on the right hand side. I then recalled that in the 25 years of sleeping together Trevor was again always on the right of me. When we were in the forces Trevor was in the next bed on the right. So what is there to glean from this previously unaware situation. Twins have always had a close affinity, that is nothing new, but I was not aware of the subconscious associated characteristics or the protective leadership of the first born. So did we look alike? For many years I have noticed when I see a reflection of myself I can see Trevor. The number of times I have been mistaken for him are too numerous to say short of mentioning on a recent visit to the hospital to see Trevor, who by this time was extremely poorly, I was confronted by a male nurse who insisted, in spite of my protestations, in congratulating me on my remarkable recovery. Did we sound the same? During 1997 Trevor rang my office using the company line and not my direct line. This meant he had to go through the switchboard. When he asked for Brian the operator thought it was I having a joke so she told him to stop messing about and disconnected the line. Trevor, somewhat confused by this, tried once again but to no avail, he was cut off. Unaware of this situation I walked passed the reception to be confronted with a very disturbed and apologetic switchboard operator. In our early teens when we wanted to join a dance band we found none had vacancies for two trumpets so we formed our own. We eventually attracted some of the best instrumentalists in York and started to think about a career in music but to be on the safe side we continued our studies in engineering. When we were 21 we received our call up papers for two years National Service, what a shock that proved to be. Together we successfully auditioned for the Royal Signals Staff Band. Once again, as two trumpeters, we were sent to perform at a variety of functions, some in the presence of the Royal Family. After National Service we went back to college for one year before joining a local instrument maker as design engineers. When Trevor was 30 years old he decided to go into technical teaching where he remained until his retirement. Trevor had many interests and whether it was at work or for pleasure he was not satisfied with 2nd best. An example of this was as a lecturer in engineering design when the future was changing from hand drawn objects to computerised digital images that could activate machinery, often referred to as CAD, CAM. There were no lecturers in York qualified to teach these subjects so Trevor taught himself. He studied to such a high standard that he became an accepted authority, publishing various papers and books. Some of these books are still being sold today. Trevor eventually became the department Curriculum Manager for the York College. In addition, Trevor in his retirement still visited colleges and universities to make sure courses in CAD - CAM were conforming to the required high standard. That was Trevor at work - what was he like at play? Firstly lets look at music. When in short trousers, playing the cornet, he competed in his first slow melody competition - yes he got 1st prize. His playing progressed bringing many rewarding experiences from the orchestra pit at York Theatre Royal to the Royal Signals fanfare team - from the stage at the old York Empire to the stage at the theatre in London's Leicester Square - from brass bands to dance bands - from small ensembles to full orchestra. Trevor was also an accomplished composer, arranger and conductor. He was the conductor of the Rowntree Brass Band for a period and took the band to Scotland for the commissioning of H.M.S. York. He has a framed photograph in his home showing his presentation of manuscript to Prince Charles which he composed, and had played by the Rowntree Band as a tribute to the Queen when visiting York. Some of Trevor's achievements are recorded in the published books "Rhythm and Romance" and "100 years of Nestle Rowntree Band". Trevor devoted lots of time teaching his two sons, Ian and Howard, the art of being a musician. His philosophy of '2nd best is not good enough' is clearly in evidence in Howard and Ian who have achieved the highest of accolades in their chosen profession. Another interest that Trevor pursued in later years was that of painting and sketching. His skilful architectural draughtsmanship allowed him to bring to life buildings be it York Minster or a North Yorkshire barn. He was commissioned to produce pen and ink drawings of local village scenes for reproduction as post cards. He also enjoyed much success with his art in local competitions and after some ten years completed what he thought would be his final work, which included York Minster in the background. It took many months to complete and Trevor was looking forward to another 1st place, unfortunately he only achieved 3rd place. Later, in conversation with him he said the judges had got it wrong (or words to that effect). He then decided he would enter next year because he knew what the judges were looking for. He then commented "if that's what they want then I'll give it to them". The next year he entered his final sketch - yes he got 1st place. So what next? We didn't have long to wait; he was going to be a wood carver. He started by studying architectural styles and completed a portfolio of hand drawn shapes. He bought some carving tools and practised carving various examples before he was content in taking the next step of introducing these shapes into his designs for chairs, stools, coffee tables etc. He made accurate scale drawings of every piece of furniture before starting to carve; his view was "if I can't draw it then I won't be able to make it". With his '2nd best is not good enough' approach he perfected his skills and produced some stunning work which he submitted for competition - yes he did get many 1st places as well as Best in Show. To give you a brief glimpse of the private side of Trevor I have to tell you he gave every penny he won back to the church or charity. Two years ago Trevor got the news we all dread, he knew his life was finite, in typical Trevor fashion he meticulously planned his last chapter. He wanted to have a Swan Song; something embodying what Trevor stood for. Focusing his mind towards the positive he decided he would undertake a most difficult and intricate carved object. I recall Trevor carving away at a nondescript piece of wood and saying "this is my Swan Song I hope I finish it". He did achieve his objective and produced the most wonderful oak carved-framed mirror. The sheer beauty of his workmanship will move all who see this but above all there is a message, which for me brings admiration along with a tear for the memory of Trevor. So what of the future? - Once again "alone together". I want to quote the words from the song "We’ll be together again":- "Here in our moment of darkness remember the sun has shone - Laugh and the world will laugh with you - cry and you cry alone - no tears, no fears - remember there’s always tomorrow - so what if we have to part, We’ll be together again." Earlier I said "together is the word that encompasses the life of twins" and so it shall be, Trevor will always be a part of me and shall remain forever - affectionately Our Kid. Trevor spent his early life playing cornet with Rowntrees Brass Band and trumpet in the York Dance Band scene and ran his own Dance Band with his twin brother Brian. 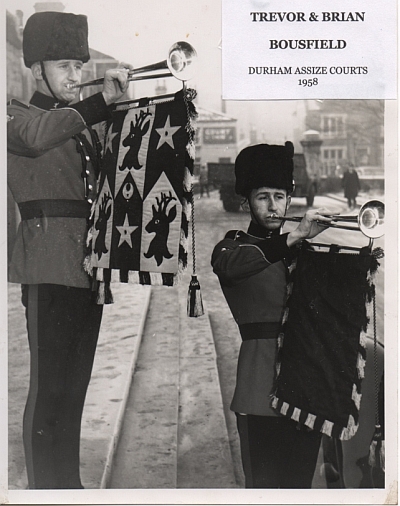 Whilst serving his National Service, he was assigned to the Signals band where he had numerous opportunities to play for many dignitaries. For a while Trevor took a break from the music scene in York to bring up his two sons Ian and Howard. He dedicated this time to teaching Ian, Principal Trombone with the Vienna Philharmonic, and Howard, cornet player and conductor of Greenalls Brass Band, Rowntree Mackintosh and York Railway Institute. During this period he was invited to conduct both York Railway Institute and Rowntree Mackintosh Brass Band. At this point he spent many hours arranging and composing music for brass band. Trevor decided for the latter part of his life to concentrate on spending time with his wife Joan, perfecting his skills as a craftsman in wood and enjoying his caravan by the sea in Filey on the East Coast. A very quiet and caring man who will be missed by all his family and close friends. York Railway Institute Band is a constituent part of York RI - a Charitable Incorporated Organisation, registration number 1165513. We are a contesting band, competing in the Championship Section in the North of England Region of the National Brass Band Championships of Great Britain.